Now that it's sort of warm-ish and I'll actually spending time outside, I'm making sure all my sunscreen ducks are in a row. 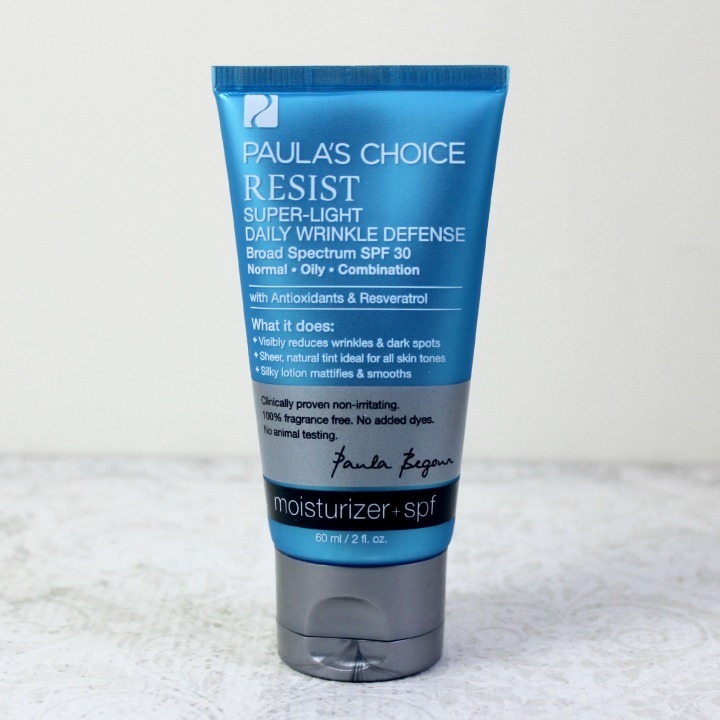 I recently picked up a few new SPF products to try, but there's one that was already in my collection that may have already beaten them all in terms of comfort for everyday wear: Paula's Choice Resist Super-Light Wrinkle Defense SPF 30. "Resist Super-Light Daily Wrinkle Defense SPF 30 is a daytime moisturizer with sunscreen designed for combination to oily skin with signs of aging. Its multi-purpose formula not only protects skin from sun damage, but also fortifies it with potent antioxidants to repair and stimulate collagen production for firmer skin. You will see a more even skin color, fewer visible lines and wrinkles, and the return of a younger healthy-looking glow. This gentle, mineral-based formula has a sheer tint that works beautifully for all skin tones, whether worn alone or under foundation. 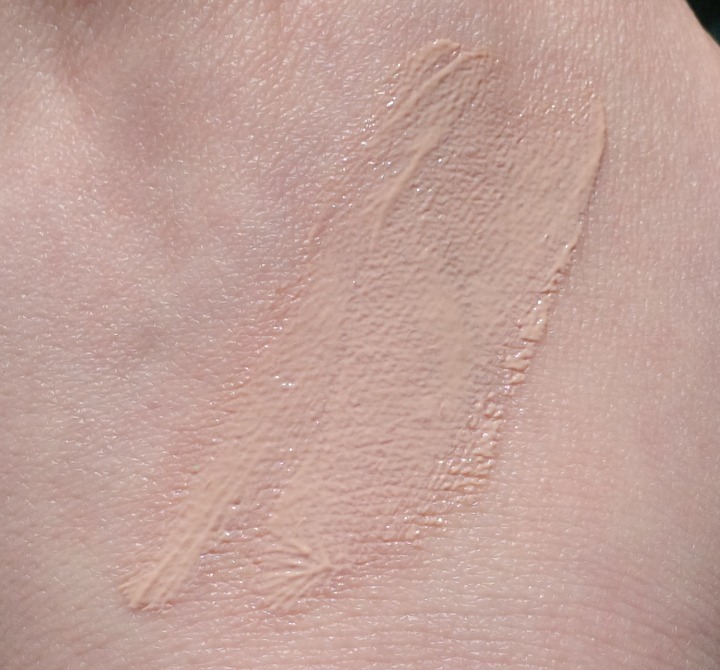 An amazingly silky lotion texture leaves a soft matte finish that perfectly preps skin, allowing makeup to apply smoothly and evenly (no primer needed). Pure, refined zinc oxide provides remarkable broad-spectrum protection without making skin more oily or triggering breakouts. It is perfect for sensitive skin or rosacea and great for use around the eye area. Daily sun protection is crucial for preventing wrinkles and brown spots, while still allowing skin to look fresh, even, and healthy." Resist Super-Light Wrinkle Defense (blah, what a mouthful) is touted as a daytime moisturizer for combination to oily skin types. I would describe my skin type as combination but leaning towards the drier side and I still found this product to be very suitable for my needs, but bear in mind that I typically wear it with a moisturizing serum (and sometimes a a light moisturizing emulsion) layered underneath. Active Ingredient: Zinc Oxide 13% (broad-spectrum sunscreen agent). Other Ingredients: Water, Cyclopentasiloxane (silicone slip agent), PEG/PPG-18/18 Dimethicone (silicone-based thickener), Dimethicone Crosspolymer (silicone suspending agent), PEG-12 Dimethicone (silicone-based thickener), Resveratrol, Quercetin, Epigallocatechin Gallate (antioxidants), Tocopheryl Acetate (vitamin E/antioxidant), Tetrahexyldecyl Ascorbate (vitamin C/antioxidant), Adenosine (cell-communicating ingredient), Lauroyl Lysine (skin-conditioning agent), Bisabolol (anti-irritant), Trihydroxystearin (thickener), Salix Alba (Willow) Bark Extract (anti-irritant), Punica Granatum (Pomegranate) Extract (antioxidant), Haemstococcus Pluvialis Extract (astaxanthin/antioxidant), Hydrolyzed Corn Starch (thickener/mattifying agent), Polysorbate 80 (emulsifier), Hydrated Silica (thickener/mattifying agent), Triethoxycaprylylsilane (silicone-based binding agent), C12-15 Alkyl Benzoate (emollient thickener), Isopropyl Titanium Triisostearate (texture enhancer), Caprylyl Glycol, Hexylene Glycol (preservatives), Sodium Chloride (stabilizer), Ethylhexylglycerin, Phenoxyethanol (preservatives), Iron Oxides (natural pigment). This is a mineral-only sunscreen. No titanium dioxide, just zinc oxide. It's also loaded with a whole bunch of antioxidants and emollient ingredients. The Paula's Choice website suggests applying this as the last step in your morning skincare routine, and to reapply during every two hours of sun exposure. They also suggest using a water-resistant sunscreen instead if swimming or in otherwise wet conditions... common sense? Let's not beat around the bush here: I think this product is phenomenal. 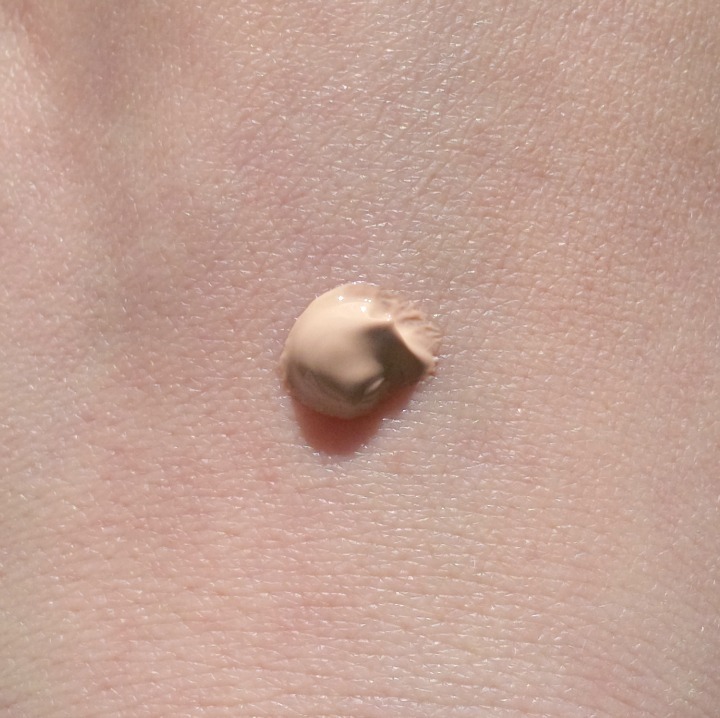 It's one of the lightest-feeling SPF products I've ever used. The fact that it's this light and SPF 30 makes me wonder why there are so many SPF 15 daily moisturizers out there that feel heavy and greasy as hell. Anyway, I've been using Resist Super-Light Wrinkle Defense for about two months now... I can't really tell if it's done anything for me in terms of collagen production, but I have used it under a variety of conditions and I can say that it does not pill up under makeup or make it slide off, make my face feel greasy, break me out, or generally bug me in any way. It honestly feels like I'm wearing nothing at all. I feel like this product would be best suited to oily or combo skin types. If you have dry skin it's simply not going to provide enough hydration as a standalone daytime moisturizer, though if you're willing to layer another cream or emulsion underneath, it's definitely workable. The only even remotely negative thing I can think to say about this product is that it doesn't smell especially amazing—there's no added fragrance, so it just kind of smells like the raw ingredients, which I guess I'd describe as vaguely sour. But honestly, it's so subtle that most people probably wouldn't notice any scent at all. Paula's Choice Resist Super-Light Wrinkle Defense is a superlative SPF moisturizer for oily/combo skin that feels light as air. The lack of added fragrance also makes it a good option for sensitive-skinned folks to try. 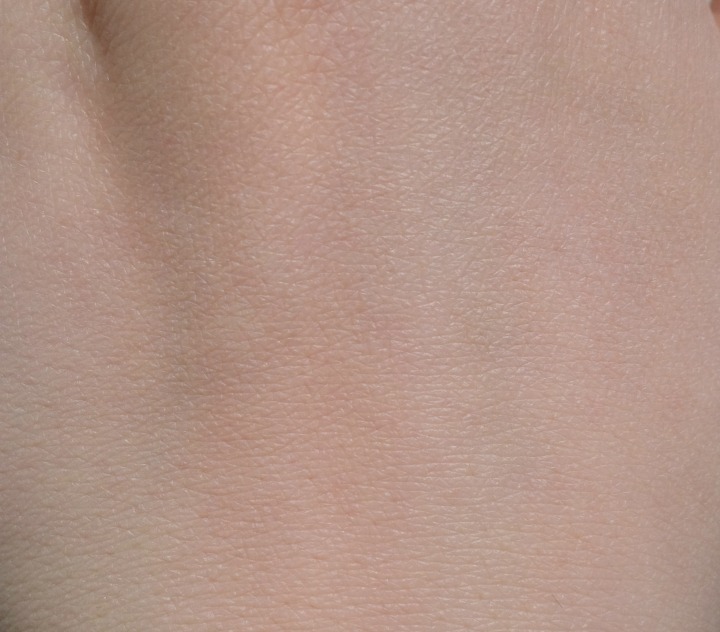 If you have normal to dry skin, you'll want to pair it with another moisturizer underneath. Folks who spend a lot of time being active outside might find a waterproof sport sunscreen to be a better choice, but for everyday use on your face and hands, it's top-notch. What do you think of Paula's Choice Resist Super-Light Wrinkle Defense SPF 30? What's the best SPF product you've ever tried? This is what I use as a sun screen, too. I love that it's tinted but blends right in. It doesn't make me feel greasy either. When I first started using it I thought it was causing me to break out but it ended up being something else I was using. I love it. I think the "tint" really just neutralizes the white more than anything else. This is such an awesome SPF moisturizer, I wish I had discovered it sooner! This is the second time this week that I've heard about this. I wear spf 30 every day, so this sounds like a great product for me. It's so hard to find a daily sunscreen that won't make you break out or oily. I honestly think this one is worth every penny. I got my mom to try it too when I was visiting her and she ooh-ed and ahh-ed at how well it sunk into her skin. Paula's Choice actually sells little sample packets of most of their products, including this one - this would be a good time to try it that way because they're offering free shipping on all orders this month. I've been tempted to try this one, because my sister likes it a lot. It sounds great! But I have too much other sunscreen that I need to use up first. I'll have to remember. I love this product I also have combination skin but mine is more on the oily side and it works wonders. Glad to hear you like it too! It really does seem well-suited to oily skin. I'm impressed with how ungreasy it feels.